Inspired by the work of artists Izziyana Suhaimi, Inge Jacobsen and Lauren Di Cioccio, I decided to keep it simple for my first trial and to go with an illustration rather than a photograph. 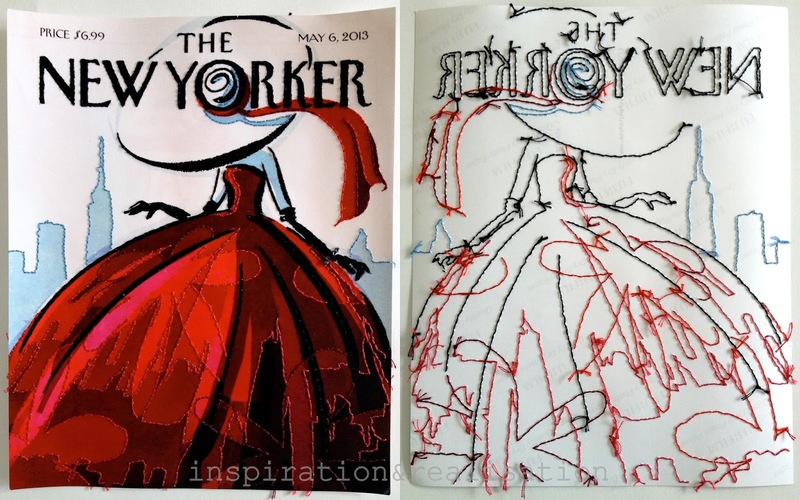 I love the "A woman dressed in red" by Birgit Schoessow on The New Yorker's cover and decided to give it a try. I took a picture of the magazine and had it printed on a 8x11 photo paper, because the cover is so thin I was afraid to tear it while stitching on it. punching what I would have stitched color by color. It took me about three nights, so yes, it was time consuming. but once I started stitching, I kept adding more and more details and couldn't stop. Embroidery on paper is highly addictive!! Again, to keep it simple for my first trial, I used a running stitch, and stitched over twice so it would look like a continuous line. And here my favorite part: the details! This is part of a fashion project that will be shared in the next few days ;) check back later in the week, ok? Oh I love this! I am definitely going to do this. You did such an exceptional job. You are always so full of inspiration. I second Janlynn's comments! You rock! I love this!! !